Birthplace : Brocton, New York, U.S.
George Mortimer Pullman was an American industrial innovator who developed the railroad sleeping car and built a big business with it. He was one of the last industrialists to operate a company town. George Pullman was born on March 3, 1831, in Brocton, N.Y., but his parents soon moved to Portland, N.Y. His upbringing in the Universalist Church greatly affected his later philosophy of labor. His formal education ended at the age of 14, and in 1845 he started work in a general store. After his father died, Pullman agreed to finish his father's contracts to move some homes in the path of an Erie Canal widening. Upon completion of that work in 1855 he moved to Chicago, where he entered the business of raising buildings onto higher foundations to avoid flooding because much of Chicago's land area was only a few feet above the level of Lake Michigan. The idea of a sleeping car for railroads was not new, and various efforts had been made to construct and operate such cars before Pullman joined the field. He formed a partnership with Benjamin Field, who had the rights to operate sleepers on the Chicago and Alton and the Galena and Union railroads. Pullman remodeled two passenger cars into sleepers, using the principle of an upper berth hinged to the side of the car and supported by two jointed arms. Business grew slowly but steadily until the Civil War. In 1862 he went to the Colorado goldfields, where he operated a trading store and in his spare time continued to develop his sleeping car. Returning to Chicago, Pullman and Field constructed the "Pioneer" sleeping car, which became a classic in rail history. Its initial trip conveyed Abraham Lincoln's widow from Washington to Springfield, Ill. Other railroads began to use the Pullman car. In 1867, the year of Pullman's marriage, the Illinois legislature chartered the Pullman Palace Car Company, which eventually became the world's largest such building concern. Initially, Pullman contracted for his cars; in 1870 he began construction in Detroit, although the headquarters remained in Chicago. The Pullman company always leased sleeping cars; it never sold them. By 1880 Pullman had acquired land in the Calumet region of Chicago, where he constructed a new factory and a company town. Deeply disturbed by depressing urban conditions, he envisioned his town as a model of efficiency and healthfulness, though it was planned to return a 6 percent profit. The town cost over $5 million. A serious strike in 1894 marked the beginning of the separation of factory and town. Pullman died in Chicago on Oct. 19, 1897. 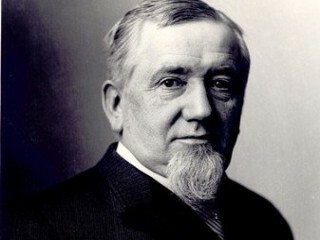 View the full website biography of George Pullman.